Nana’s House was built in 1906 in Washington Township, on the 160 acre farm, owned by Henry Chris Bowman, an enterprising farmer, and his wife Bridget (Woods) Bowman. Native lumber from the farm was used to build the 2 story Victorian farm house. The oak woodwork, oak stair case, and built in courting bench in the front hall are all original to the home. 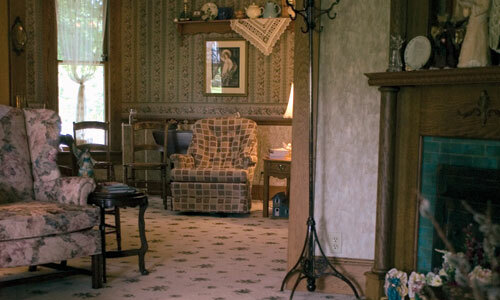 The inn’s bedrooms and parlors all have southern yellow pine wood floors. The barn was built in 1911 and is still being used. Henry and Bridget were fortunate to have a natural gas well and artesian well on their farm. Genial and hospitable by nature, Henry Chris and Bridget were popular in the community of Greensburg. Ed and Joann Burkhart purchased the home, barn and 11 acres in 1974. 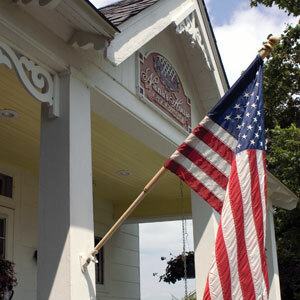 We raised our family here and opened our Bed and Breakfast in 1998. We have planted lots of trees and made walking path so our guests can enjoy nature and walk down to the small creek. There are lots of different birds and you might even see a deer or wild turkey. We invite everyone to step back into the past and enjoy the simple pleasures of life at Nana’s House. Greensburg with a population of 10,260 is the county seat of Decatur County, Named in honor of Commodore Stephen Decatur. Among the first settlers was Colonel Thomas Hendricks, who plotted and laid out the streets for the settlement in the year 1820. The first building, a double log house, was erected by Colonel Hendricks on what is now East Hendricks Street. The first election was held May 3, 1859 in this house. Also, the first court and general meeting was held there. He was the first Representative from Decatur County to the State Legislature, and also served terms as State Senator. Greensburg was founded in 1821 and was named in recognition for the native city of Mrs. Thomas Hendricks which was Greensburg, Pennsylvania. It was then incorporated as a town in 1837, and became a city in 1859, with a population of 1,200. It is located 47 miles southeast of Indianapolis, and about 57 miles northwest of Cincinnati, or roughly midway between those two cities. The city is highly publicized, and well known world-wide as the “Tower Tree City” since 1870 when a tree was first sighted growing from the tower of the court house, which was built on the present site in 1853.